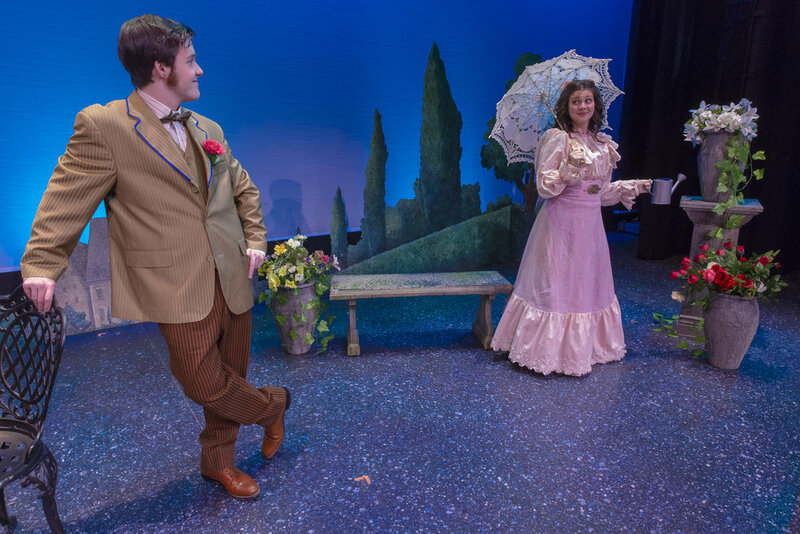 The Importance of Being Earnest was directed by Michael O'Neill at Lafayette College's Weiss Theater in April 2018. My discussions with the director of the show, Michael O'Neill, led me to choose a primarily realistic design for the show. We decided that each act should primarily be a single look, which would not change enormously throughout. We also intended to have footlights which would help light the actors' faces, as they were likely to be wearing hats for large portions of the show. However, the footlights ended up being impractical. This concept image uses set designer Kyle Dixon's sketches for the set and false proscenium. For Act I, I planned to have warm lighting coming from the front and cool lighting from the side. Along with these, there would have been footlights to help light the actors' faces. 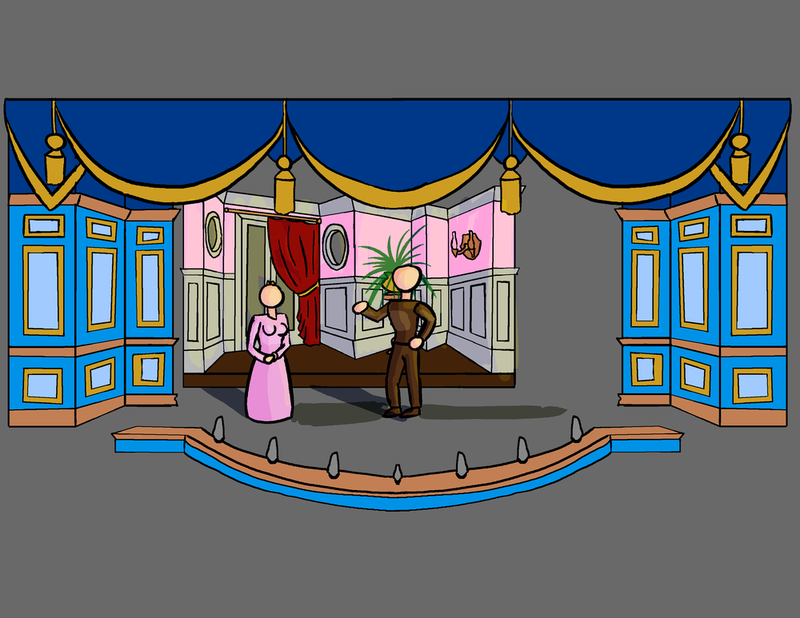 The figures in this storyboard are wearing clothes the color that Lady Bracknell and Algernon were to have been wearing. The backgrounds for these storyboards were traced over set designer Kyle Dixon's sketches for the set and false proscenium. Act II was planned to be similar to Act I - however, the front and side lights would have come from the opposite sides. Additionally, there was to be a gobo making the stage appear to be covered in leaves. The figures in this storyboard are wearing clothes the color that Gwendolyn and Doctor Chasuble were to have been wearing. Act III would remove the gobo, but retain the same direction of light, as it occurs very shortly after Act II. The figures in this storyboard are wearing clothes the color that Cecily and Jack were to have been wearing. Each act was designed to have roughly similar looks - warm amber light from the front and top, with blue sidelight to help highlight the actors and sculpt their forms. This is the result in Act I, with sidelight coming from stage right. It can be seen in the shadow of Lane's neck, suggesting a deeper and more vibrant shadow. The color of the Act I's cyc can also be seen in this shot. It's a warm, light brown, taken from the wood of the couch which Algernon and Jack are sitting on. The sculpting effect of the blue sidelight can also be seen clearly in this photo, highling Lane strongly and Algernon slightly less strongly. All characters are clearly visible, including the face of Gwendolyn, despite her hat. 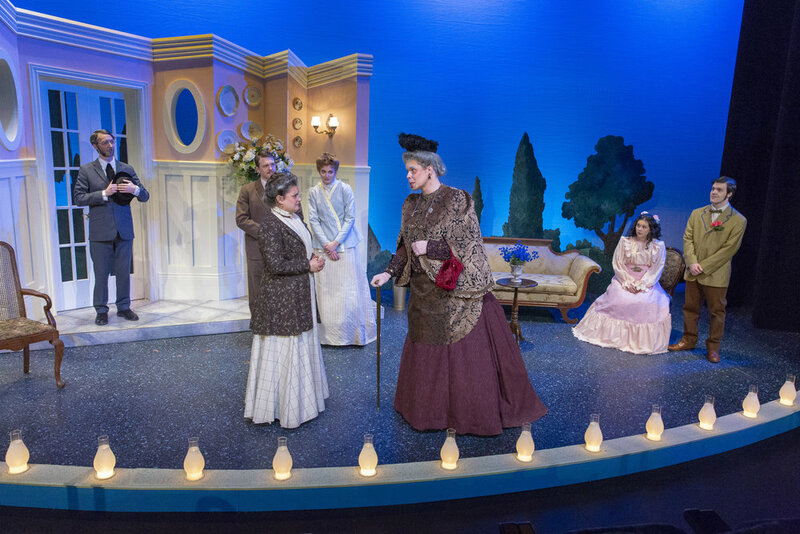 Unfortunately the design of the set did not allow for practical footlights which would have helped to highlight the characters' faces better. The aesthetic footlights built into the set, however, can be seen in the bottom right. Each act began with a tableau, which was lit in a dimmer and more blue light until the characters unfroze and began to move. The aesthetic footlights are clearly visible at the bottom. Also visible is Act II's cyc, which is sky blue, as this act takes place outdoors. Act II.ii - "My poor brother Earnest, dead!" After the tableau concluded, the light became a similar amber with blue sidelight. However, the amber in Act II is paler than the amber in Act I, as it is mimicking sunlight rather than houselights. The effect of the blue sidelight, which in Act II comes from stage left, can be seen on Jack's face. Act II.iii - "He knows perfectly well what he did!" 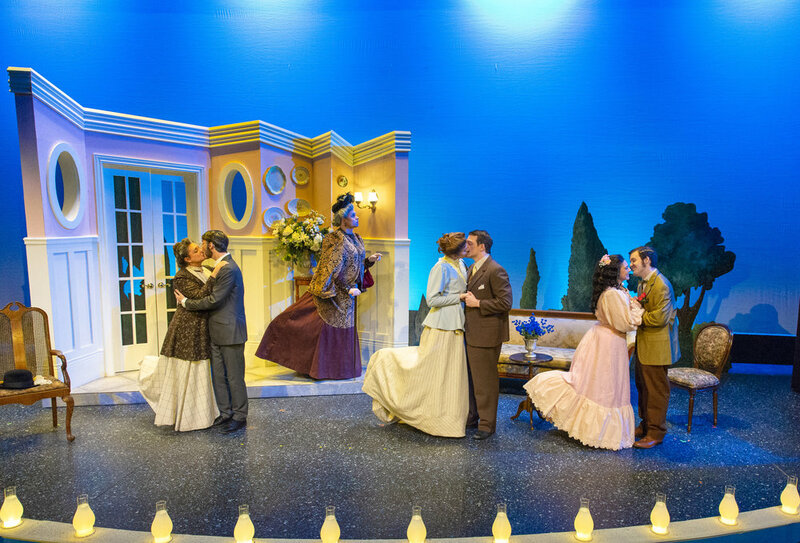 As with Act I, all characters are clearly visible regardless of their place on stage. Act II.iv - "I fear he might look just like everyone else." When characters have an aside, they step forward and are highlighted by a pair of moving lights while the remainder of the stage dims. This can be seen in the contrast between the lighting of Cecily and Algernon. Act II.v - "Hello, dear Cecily." In the first scene in which each pair of lovers are alone together, the amber light becomes more pink to emphasis their feelings. 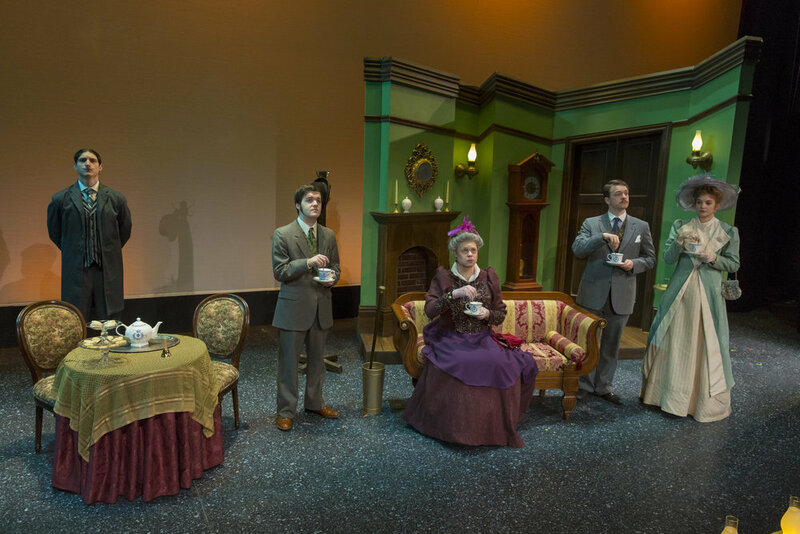 This occurs once in Act I, between Jack and Gwendolyn, and once in Act II, between Algernon and Cecily as well as between Miss Prism and Doctor Chasuble, with no pause between. 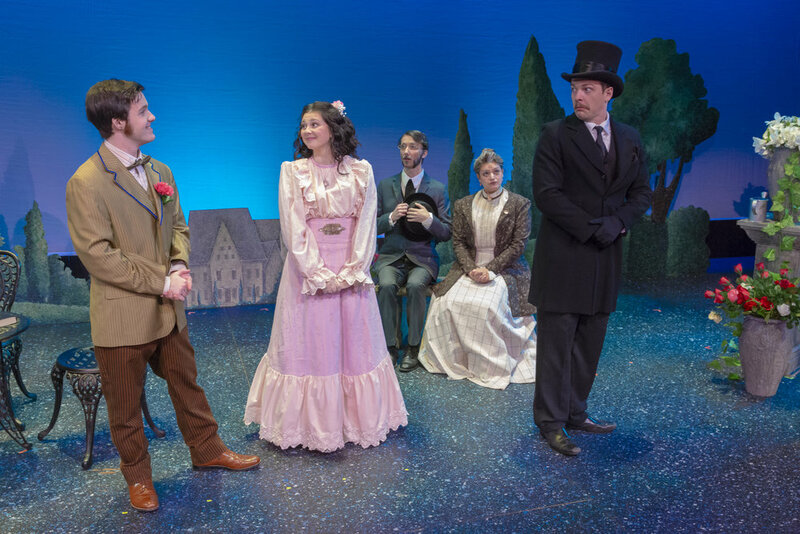 The pink tinting returns in Act III when it is discovered that Jack's real name is Ernest, and all the love stories are resolved. Act III.i - "Stand up straight, young lady!" Act III is designed much like Act I, with the exception of the sidelight remaining from stage left and the cyc remaining blue. The blue cyc remains because of the windows and door into the outside, as well as to provide contrast against the pink wall of the set. Once again, all characters are clearly visible regardless of where they are onstage. This is particularly important in Act III as it is the most crowded act. Just as they begin with a tableau, each act ended with one, the light becoming considerably more amber to transform the stage into a picture. 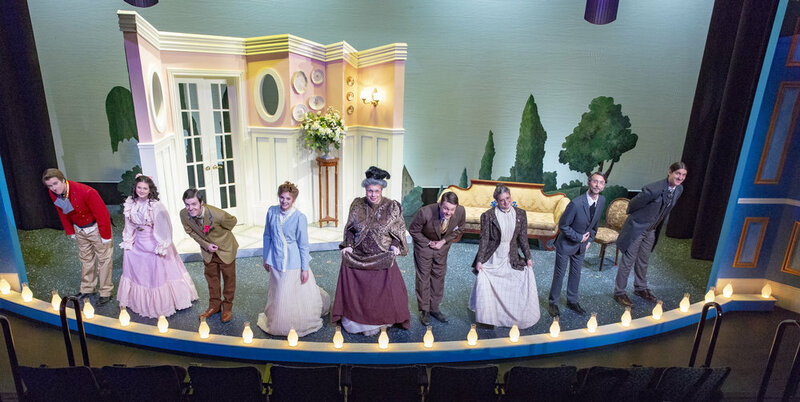 The bows return all light to a simple white, allowed the actors to be themselves rather than continue appearing as their characters. The plot went through substantial revision during tech week, but this is the final version. I divided the stage into six areas in a 3x2 grid, and endeavored to light each area from the top and from the sides. In addition, the entire stage was divided into two halves, each of which could be lit by two lights from the left and from the right. There are also six lights arranged to serve as curtain warmers, allowing me to tint the black curtain to match the false proscenium. Plus, there were lights set up to highlight the false proscenium itself. There were three toplights which each covered one-third of the stage, and seven lights for the cyclorama - three at the bottom and four at the top. Lastly, there were two moving lights, which were used for asides. I also had five lights hung on each gallery. Two of them were used as frontlights - the previously mentioned frontlight that lit the stage in two areas. Three of them were sidelights, arranged in three lanes. Both sides of the theater had identical layouts. I originally intended to have two sidelights from each side, matching my grid, but was forced to add an additional light to compensate for the two legs, which otherwise would have cut off much of the light. The Weiss Theater where this show took place has a full complement of LED lights, so I was not forced to have multiple angles of light to give me color options. However, I needed multiple lights in order to make the stage as bright as the director wanted.